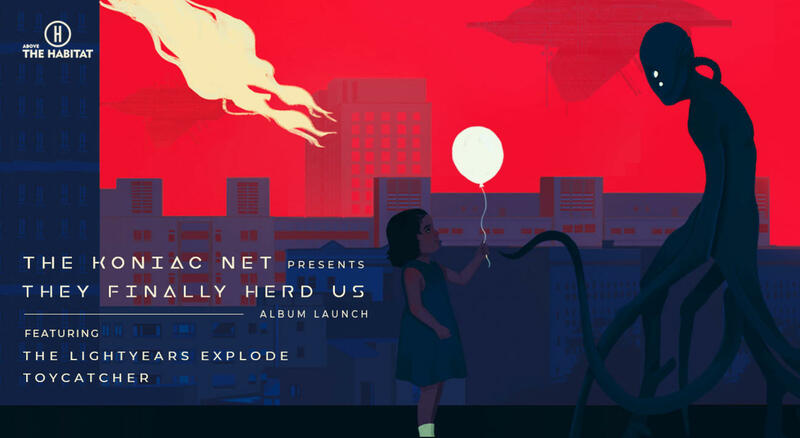 The Koniac Net is hosting a launch gig to release their new album - They Finally Heard Us. This is our third release and second full-length album. The album has been 4 years in the making and we can't wait until it will finally be out on all major platforms on March 29. The launch gig on March 30, is going to be one big party with two amazing acts performing with The Koniac Net- The Light Years Explode and Toycatcher! Above The Habitat, is the perfect venue for this event. It has incredible sound, great deals on food and drinks and plenty of space for you to jump around and practice your uncoordinated dance moves. We hope you will all listen to the album on Friday the 29th, come party with us at the gig on Saturday the 30th and sleep all through Sunday! The Koniac Net - An Indie / Alternative / Hard Rock band from Mumbai, India. Songs from both, their album & EP's, have gained airplay on over 155 radio stations across 32 countries. They have been featured by MTV, VH1, Rolling Stone Magazine, GQ Magazine, VOGUE, Buzzfeed, BalconyTV, Apollo Night LA, WeSauce, Sofar Sounds and many more. The band recently released the music video for Crawling, a single from the upcoming album. It's now playing on VH1 and can be streamed on YouTube. The Lightyears Explode - A three-piece Garage / Indie / Punk band from Mumbai, India. Formed in 2009, the band comprises Jeremy D’souza on drums, Shalom Benjamin on bass and Saurabh Roy on guitars/vocals. The band draws inspiration from various places, ranging from The White Stripes to Ganpati Visarjans, forming their very own blend of Masala Punk! Toycatcher - An alt-fun, fake-punk, post-10PM trio formed by Dinkar, Aarifah and Tejas. It's the high school band that left high school a long time ago. They've been featured on internet show 'Son of Abish' and will have shared the stage with bands such as The Koniac Net and The Lightyears Explode after this show.